The title of this film suggests a more action-packed story. But maybe that is the subtle irony in this dramatic exploration of a family’s secrets and lies. 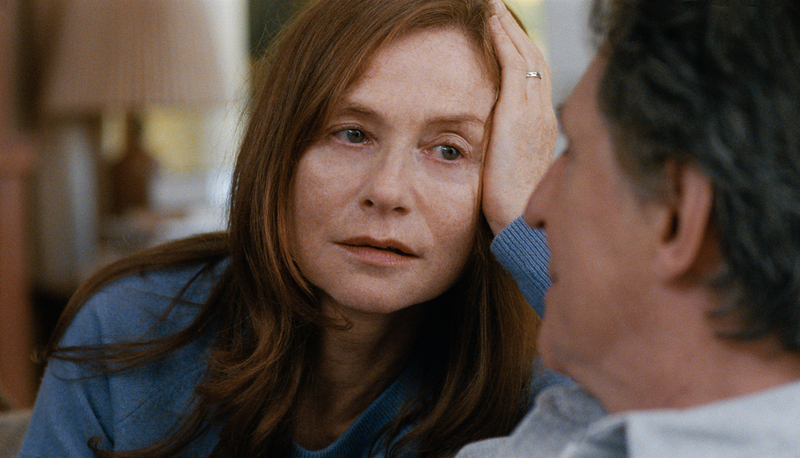 It is in the days leading up to a posthumous exhibition and tribute to the work of Isabelle Reed (Isabelle Huppert), an award winning war photographer, which brings together her husband, Gene (Gabriel Byrne), his two sons, Jonah (Jesse Eisenberg) and Conrad (Devin Druid). Isabelle has been dead for three years as a result of a car accident under questionable circumstances. Her existence was what they had in common and without her they seem to have drifted apart. Image Above: ©Jakoblhre & Motlys, In scene with Isabelle Huppert. Jonah, the eldest son has just become a father and Conrad, a sulky adolescent, still lives at home with his father, Gene, a college professor who gave up his acting aspirations to be a stay-at-home dad while Isabelle traveled the world to cover the most dangerous geopolitical hot spots. There is a decided feeling of disconnectedness between them as if they are harboring unexpressed feelings of pain, guilt, regret or anger. Her untimely death only reinforces the sense of abandonment that her career fostered. They are not very demonstrative or supportive toward one another and seem to have more or less shut down. Image Above: ©Jakoblhre & Motlys, In scene with Jesse Eisenberg. Obviously, this event will be an emotionally fraught time for all three of them who seem not to have fully processed the significance of Isabelle’s life and death on themselves individually. The ghost of Isabelle haunts them in different ways and we only see her in flashbacks and one gets the impression that this is a metaphor for how they experienced her, as an absentee presence who dropped in periodically but with profound impact. I suppose the best way to describe the unfolding story is one of collateral damage which no one has acknowledged. Image Above: ©Jakoblhre & Motlys, In scene with Jesse Eisenberg and Devin Druid. It is convincingly well-acted by the entire cast, including the always appealing David Strathairn as a colleague of Isabelle’s in the trenches and whose relationship with her seems to mirror that of the men in her family. Isabelle is revealed to us from the point of view of each of these men - an alluring yet elusive presence. The catharsis takes the form of acknowledging and releasing unexpressed pain and resentment. The final gift from the absent Isabelle, whose talent was communicating through images - is allowing the men in her life the opportunity to feel and communicate with words.